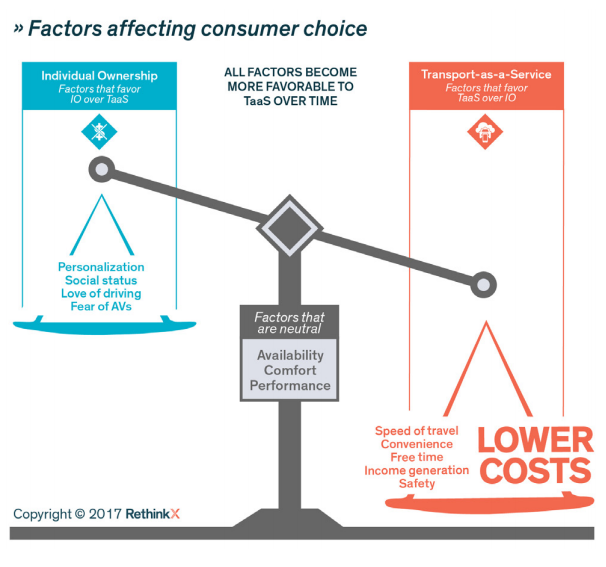 By 2030, you probably won’t own a car, but you may get a free trip with your morning coffee, writes Giles Parkinson of Reneweconomy.com. 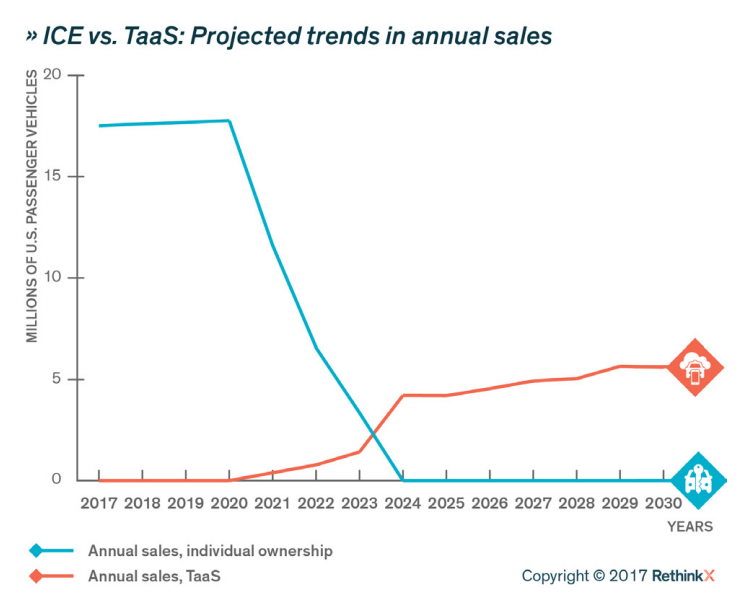 Transport-As-A-Service (TaaS) will use only electric vehicles and will upend two trillion-dollar industries. It’s the death spiral for cars as we know them today. Courtesy of Reneweconomy.com. The report, by RethinkX, an independent think tank that focuses on technology-driven disruption and its implications across society, says this stunning and radical development will be driven entirely by economics, and will overcome the current desire for individual car ownership, starting first in the big cities and then spreading to the suburbs and regional areas. Lead consultant and co-author is Tony Seba, who specialises in disruptive technologies. 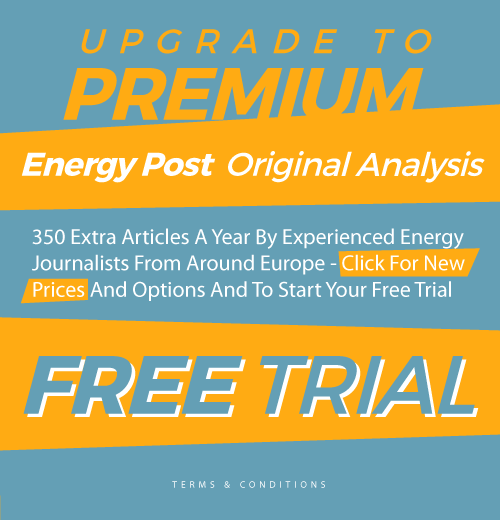 His early forecasts for the enormous uptake of solar where considered crazy, but were proved right, and he has since said that new technologies will make coal, oil and gas all but redundant by 2030). Indeed, there are some people who are starting to anticipate this change, considering Australian-based business models and even local manufacturing, such those revealed on Monday by Michael Molitor, the head of a new company called A2EmCo. Moreover, battery technology will improve, needing to be replaced only once, and old batteries will be able to be used elsewhere (in the power grid). The cost of maintenance will be one-fifth the cost of current cars, the cost of finance one tenth, and the cost of insurance also one tenth. The cost savings, the speed, the increased safety and the extra free time will be key factors. But Seba recognises that most people assume that the biggest impediments to this scenario are behavioral issues such as love of driving, fear of new technology, or just habit. But he says that what he calls “pre-TaaS” [transport-as-a-service] companies such as Uber, Lyft and Didi have also invested billions of dollars developing technologies and services to overcome these issues. In 2016, these companies drove 500,000 passengers per day in New York City alone. This article was first published on Reneweconomy.com and is republished here with permission. That’s a very aggressive prediction. The transition from today’s human driven ICEVs will have to go through stages. First, people are going to have to understand (and trust) both EVs and self-driving cars. There will be a lot of foot-draggers. Second, many people will continue to drive the cars they have, especially if they are paid off or almost so. The value of used fueled cars is likely to drop quickly and people won’t be able to get much for their car if they try to sell it. Given that they’ve got sunk investment money they will probably just continue to buy fuel until repair costs significantly rise. And gas is likely to be really cheap (low demand = only the least expensive sources will be used). Quick take-up in densely populated cities? Yes. Not having to deal with parking alone will convert a lot of people. A self-driving EV will offer door to door service. Stop and go congestion won’t be as taxing if you can get some work done or entertain yourself while the car does the driving. Last, there’s the problem of how rapidly enough manufactures will convert from gasmobiles to self-driving EVs. Tesla may demonstrate long range self-driving cars within the next 24 months. In fact, in less than two years Tesla may start turning on the self-driving function in EVs that they have already sold. Working target is next summer. 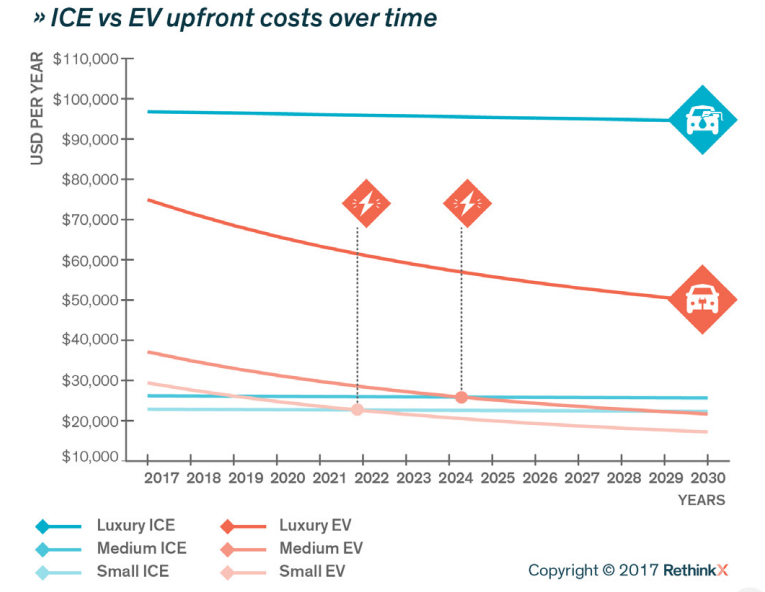 Most large car manufacturers don’t plan on having a human driven long range EV for sale for another 3-4 years. Unless ‘spontaneous’ carpools greatly cut the overall number of cars on the roads then there may not be enough supply to hit his ten year mark. But, hey!, if Tony is right that’s a great thing for us and our planet. Since time immemorial people have wanted to own a chariot, horse, sedan chair, coach, or car. They are a status symbol and people don’t want to be seen in the same ones, or boring slow ones. Self driving EVs will not change that desire. Indeed self driving EVs might increase the number of vehicles on the roads in Europe by making access to car transport available to everyone, not just those with a driving licence. I suspect status via car ownership will fade away. If people find they can cut their car expenses by 75% or so most are likely to find other uses for their money. They can brag about the fancy vacation/cruise the saved money bought them. Or wear more designer brand clothes. Owning a fancy car may drop to the level of owning a fancy walking horse. People aren’t likely to buy a car when they can ‘rent’ one that shows up at their door and costs as fourth as much as owning. Most people who don’t have a driver’s license are likely to be those too young to get one, older people with limited incomes, or people who find that bikes and public transportation works best for them. Autonomous cars would challenge our understanding of who was liable in a motor vehicle accident. Self-driving cars are like many other emerging technologies, the law develops after the technology. This has an impact on how the technology is perceived and dealt with when an accident happens. As self-driving cars are released to the public, there may be accidents involving that “human element” as the public adapts to the technology. Insurers will have to cover these types of collisions, perhaps, ones similar to Google’s self-driving car accident, in the short term. In the future, there also will be new risks to insure, such as sensor damage, satellite failure and other new technology. Added to the complexities of whether the manufacturer or driver takes responsibility, is the fact that connected cars could be vulnerable to hacking. Volkswagen has even created a partnership with a cyber security start-up devoted to protecting next-generation vehicles. Legislation in many territories looks at hacking as a criminal action. However, a responsibility will undoubtedly also rest with the car manufacturers to make sure adequate precautions have been taken to prohibit unauthorised access or use. It’s not just the quoted 10 years of regulatory approval. There are still technical issues to be resolved. Infrastructure is also expected to change as self-driving cars become readily available, and this could impact the way that insurance operates, as well. Currently, not all roads are smoothly paved with clean, visible road lines. What about snow and other weather conditions? How long will it take before self-driving cars can drive everywhere and not only on perfectly lined, mapped roads? Self-driving cars still have a long way to go before they’re fully autonomous at SAE Level 5, but once there, if the safety claims are true, insurance costs will likely decrease for both drivers and providers. I love the idea of TaaS but am gravely concerned that Tech Companies will be complicit in further dividing the US between rural middle American and the coastal Urban areas. The idea that an autonomous vehicle will be anywhere close when you live in a small town in Montana is not even remotely a possible scenario TaaS companies are thinking about at this moment. It won’t be economically feasible for anyone to provide a few vehicles for a few people in the middle of nowhere. That’s not to mention the infrastructure for EV Charging and a host of other ‘support’ things that will go missing. Remember that it took Rural Electric Cooperatives to bring electricity here, not commercial enterprise. It’s taking a similar level of effort to bring broadband and we’re nowhere close yet to having parity with even the lowest levels. Like all Tech companies and their investors, these solutions will go where the money is and in the end, make the digital divide look like a tiny problem by comparison. I’d like to see an acknowledgment of this in these studies and some genuine thoughtfulness and ideas about how to include these populations. For all the grand future talk here, we can’t afford to ignore a third of our population and still move forward as a country unless we all do it together. Why not? Why should each person/household in even modestly remote areas need a vehicle parked next to their house 24/365? Small town Montana. What, 10,000 people? Every morning a given number travel from the east side of town to the center in order to open up the town’s businesses. Why can’t a single robotaxi pick up 2, 3, 4, 12, 20 of them, take them to work, and then spend the rest of the working day hauling other people around? Perhaps if one lives a two hour drive from anyone else they might want to keep a car on hand. Or maybe not. I live over an hour’s drive from the grocery store. I go shopping about twice a month. My car sits idle most of the rest of the time. I could operate very easily by ordering up a robotaxi the day before shopping day and not having to pay for a car the other ~28 days of the month. Lots of us in the rural outerland live like that. Maybe out here in the boonies we’d use the Tesla model. Some of us would own a self-driving car and make it available as a taxi for our neighbors. We don’t have to wait for GM/Lyft to get around to servicing us. I agree with you, no one uses a car for the full time and it’s very expensive. But a car is a connection in rural areas that the tech world (and most of the rest of the country) forget. It’s wishful thinking to say that any commercial enterprise will provide a solution to a small, dispersed and highly isolated part of our population if they can’t make money on it. Doing it themselves, that’s possible as it’s been done before with Rural Electric Co-ops. Montana has a little over a million people in an area the size of Germany. A small town in Montana? 3 people. We have 7 ‘Cities’ of no more than 130K. Many people live 30 minutes away from a neighbor. Some do not have full electricity 24/7. Most do not have access to Broadband. And a recent study said that 60% of Americans didn’t even know Electric Cars were available to buy, let alone what a Tesla is. My point is, the way we have dealt with rural neighbors is to encourage them to make a change. People don’t want change, least of all the ones who feel it’s being forced down their throats. The US ignored the plight of this population during the last election. Sugar coating a solution and expecting things to change in these areas without further leaving people behind… Well, I hope someone proves me wrong but the Tech community does not have a stellar track record of paying any attention to Rural America. Some people do not want change. That’s clear. Has been, will be. I said earlier that there may be a few (very, very few) people who live so remote that they would have to wait a long time (more than a half hour) for a car if they phoned for one. That may mean that some of them will decide to own their own car. We’re talking <1% of the US population. Probably less than 0.01%. Folks who live in those conditions (aside from very large ranch operations) generally don't have a lot of money. I suspect many would be quite willing to wait for an hour for a car to take them to town if it meant cutting their monthly car costs to 20% or less. And if they called the day before they wouldn't have to wait at all. Large ranch operations are almost certainly going to have one or more pickups because they are needed on a daily basis. We don't have to concern ourselves about them. "It’s wishful thinking to say that any commercial enterprise will provide a solution to a small, dispersed and highly isolated part of our population if they can’t make money on it." I already dealt with that issue. One person in the area buys a self-driving car and runs it as a business. The EV lives at their house and they keep it charged/cleaned. Other people phone the car to come take them somewhere. Little "Uber" operations. Buy a car and have your neighbors pay for at least half its cost.